SLEEP split in 1997 after two hugely influential albums. Members went on to form underground heroes OM and High On Fire, and more recently metal supergroup Shrinebuilder. On the Marijuanaut's Return Tour, original members Al Cisneros and Matt Pike will be joined by drummer Jason Roeder of Neurosis to perform the seminal Holy Mountain album in its entirety as well as selections from Dopesmoker and more. 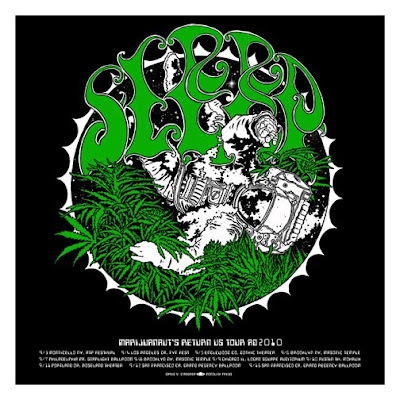 SLEEP debuted with 1991's Volume One album, recorded for San Francisco label Tupelo. Earache Records received the band’s next recordings in the mail as a demo. The label -- impressed by SLEEP's single-mindedness and unique vision -- immediately signed the band and released the tape exactly as it was received. Record stores worldwide stocked SLEEP’s Holy Mountain from November 1992 to this day. The band then signed to London Records. Their debut album for the major took the form of one mammoth 63-minute leviathan of a track entitled Jerusalem. The band resisted the label’s attempts at radio edits and bringing in their own engineer to remix the album in view of “marketability.” London balked at the prospect of promoting what probably still is the most extreme music ever recorded for a major label, so shelved the recording and dropped the band.